In order to assess nature values and land use types of the farmers and stakeholders, the socio-economic research group introduced Q Methodology which a research method used in social sciences to study people's "subjectivity"—that is, their viewpoint. Informants were asked to organize photos about management, landscape, nature values at sodic lakes according their attitude to the topic of the photo. On the left side of the raster the un-liked, while on the right side of the raster the most liked photos were positioned. Semi-structured interviewes were made with farmers and stakeholders on field in order to gather an overall view about the effects of different land use types and methods to the socio-economic development of sodic wetlands, to collect management-models and to give possible guidance to local farmers, land use managers, decision makers in order to facilitate a harmonized land use management both economically an ecologically at the sodic lake area of the Kiskunság. Questionnaires about ecotourism were filled in in great amount to gain information about the tourists’ requirements of eco-touristic development at sodic lakes of Kiskunság, but first of all at the project site. Mowing and shredding are important methods to be used in early autumn in the larger reedbed mixed with alkali bulrush on the project site. Because of the lack of precipitation in September, the dry soil surface allowed the approach of the marshy areas by the tractor. This activity is managed by the project partner Dunatáj Public Foundation, and is effectively fulfilled by the tractor purchased from Life sources. 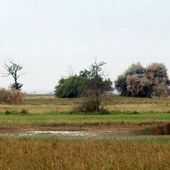 This year, as a natural prosess and essential event in the hydrology of a sodic pan, the lakebed of the Böddi-szék has dried out during the long warm and dry period of the late summer. The regular drying out is the basis of the salt accumulation process which is crucial element in the soil conditions of the sodic pan. On the surface with high salt content grows one of the most important, characteristic plant species of the Pannonian halophyte flora: Suaeda pannonica. This pannon endemic species is abundant at Böddi-szék. A salt-tolerant moss species was found at Böddi-szék. Enthostodon hungaricus is a rare and protected Moss species, it represents charachter species of the halophyte vegetation. Early Spider-orchid (Ophrys sphegodes) was found at Böddi-szék. The occurrence of this strictly protected species means floristically new data on the project area. The orchid was found during habitat mapping in loess steppic vegetation. Its presence indicates the high naturalness of the vegetation. The seminar was organised by Nimfea Nature Protection Association, in Túrkeve, Hungary. The aim of the seminar was to have an overview on the practical experiences and results of the Hungarian Life-Nature projects and other species conservational plans. Our project was presented by András Bankovics, project manager.